A simple dish full of good meat and the unusual veggie: introducing the grilled lamb chop called in Italian “scottadito” (finger-burning). Why? It is said that the lamb in this way is such a delicious dish and it is so good that everyone burns their fingers while trying to take it out of the pan! 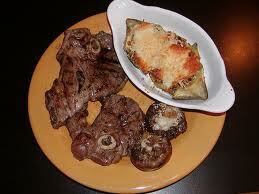 Lamb chops are good also fried and stuffed too. Typical recipe of Lazio but also well-known in Italy, with a zest of invention given by the artichokes. Mince the onion and saute’ them it in a spoon of oil until golden. Add the artichoke hearts you have already prepared and keep on cooking all for a several more minutes, stirring occasionally. Then stir in the mint leaves, add 2-3 tablespoons of water and cook over a higher heat for a few minutes more. Make a cut parallel to the bone in the meat of each cutlet, and stuff them with a little of the artichoke mixture, a few shavings of cheese, and a mint leaf. Whisk the eggs. Dredge the lamb chops in the egg mixture and then in the bread crumbs. Heat the butter and 3 spoons of oil together and cook the lamb chops, turning them occasionally, until they are golden brown on both sides. Put them on paper and serve them truly hot. This entry was posted on Tuesday, November 13th, 2012 at 5:37 pm	and is filed under Italian Recipes and Food. You can follow any responses to this entry through the RSS 2.0 feed. You can leave a response, or trackback from your own site.